Princess Yachts has had a lot of recent success and is now launching several new models. It's no secret that Princess Yachts has had great financial success the last several years, continuing its dominance in the production of flybridge, express cruiser, and luxury motor yachts. As of April of this year, Princess had more than $1 billion worth of advanced orders. Financial statements showed a record turnover that was up 25% over the previous year while profit was up considerably. Advancements in technology, ingenious designs, and a strong dealer network led to great success of models like the 68 Flybridge and the S60 Sport Bridge this past year. 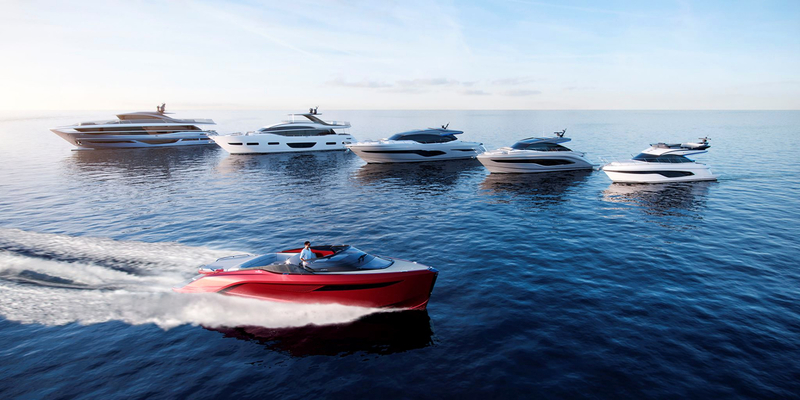 Princess has re-invested their fortunes in six new yachts that will break ground in 2018 with the R-35 already released at the Cannes Yachting Festival to a resounding audience. Princess designers have chosen to push the boundaries in the express to motor yacht experience with new style, eccentric details that exude luxury, and new technology that is meant to change the landscape in the boating industry. When you buy a Princess with SI Yachts, you get years of experience with a team that's spent time at the factory in England, sold and serviced countless Princess Yachts, and can take your trade-in if needed. There is a reason that we are one of the top selling Princess dealers in the world and it starts with our dedication to making sure our customers have a world-class experience. For Princess owners that enjoy the Flybridge model line but don't want to step up to the M-series, the new Princess X95 Super Flybridge is a perfect option. Most flybridge owners spend the majority of their time boating up top, whether driving from the upper helm or relaxing with the breeze. Flybridges have evolved to become "outdoor living rooms" with everything you need from comfortable seating, 360-degree amazing views, wet bars, dining areas, and anything you can dream up. The days of just a helm and your tender are long gone as owners now expect an additional living space to what is already on the main deck. While not much information has been released on the new X95, the layouts suggest a lot of usable space including a country-style kitchen that has grown increasingly popular in the American markets. The new X95 will be aimed at owners wanting to entertain, cruise for long periods of time, or even put her into charter. The power on board is said to be twin MAN V12 diesel engines that give the X95 a top speed of 24-26 knots as well as a bulbous bow that extends the waterline allowing exceptional fuel efficiency and cruising range. Stay tuned to SI Yachts as new photography is released. If a 28-meter yacht is a little too big, fear not. Princess has unveiled the first renderings of the all-new Y85 Motor Yacht. The stylish exterior is of the new Princess Y85 is both "traditionally Princess" yet refreshingly contemporary. As with all of their larger yachts, Princess does an excellent job designing each space with the right ambiance and seating layout without feeling cramped. The flybridge on the Y85 offers seating around the upper helm, a large couch with dining table, well-equipped wet bar, and a fantastic sun pad. Powered with twin MAN V12 engines that push the Y85 to over 30 knots, riding from the flybridge is a treat. Upon entering the salon of the Princess Y85, you'll immediately notice how light and airy it is. Massive windows line each side of the salon and galley that, when complimented with the light-colored furniture, really opens up the space. The main deck consists of the aft cockpit dining area, the salon, galley, and inside helm. The four ensuite cabins are beautifully appointed with ample storage space, particularly the full-beam master stateroom. If you own a Princess Yacht or have been looking into the brand, it's impossible not to have inquired about the popular V-series model line. The V-series express yachts offer single-deck living, a deep-V hull for stability and comfort underway, and all of the luxurious accommodations found in their much larger yachts. Coming soon, the Princess V-class will have an amazing new flagship model - the Princess V78. The original V78 first debuted in 2008 during the financial recession and thus the model never really took off in the U.S. market despite its pedigree. For the express yacht owner that loves the performance of the V-class line, the new V78 should not be overlooked when moving up to a larger boat. Twin MAN V12 engines propel you to just under 40 knots so the experience of driving the V78 is nothing short of exhilarating. Whether you are lounging in the salon or recharging in one of the plush staterooms below deck, the interior of the Princess V78 is an oasis meant to replenish your energy and escape the sun. Or is it? With massive side hull windows, an electric sunroof that opens, and a sliding glass door aft that opens almost completely, you can bring the outdoors in when everything is opened up. Perfect for catching some rays in comfort or enjoying the weather on a crisp autumn day while cruising the intracoastal. Eight guests can enjoy four large, en suite staterooms below deck including a spacious full-beam master suite. Contact your SI Yachts Sales Professional today to get more info about the Princess V78 and the full V-series model line. You can also read up on proper yacht maintenance tips. The all-new Princess V60 may be a slightly smaller yacht than the flagship V78, but it doesn't feel that way. The Princess V60 is all about entertainment. Multiple areas on board offer places to sit and socialize, bathe in the sun, or grill out with a cocktail. The aft cockpit is the center of the outdoor entertainment spaces with a generous seating area, barbecue grill, and a fully-equipped wetbar. Princess also uses the very best audio equipment for a spectacular sound while you're enjoying your time away from the daily grind. Twin MAN v8 1200hp engines make driving the V60 downright fun as it tops out at just under 40 knots while the patented shape of the deep-v hull lets you slice through waves at ease. Her sociable galley placed aft is arranged with an open-plan dining area, sliding doors, and a fully opening window leading out to the cockpit. Below deck, six guests are comfortably accommodated across an en suite full-beam owner's stateroom and two further guest cabins with the option of an additional crew cabin aft. For more information on the new Princess Yachts V60 and where you can see it next, contact your SI Yachts Sales Professional today. The Princess Yachts 43' Flybridge has been an exceptional model in terms of sales and owner satisfaction and soon that model will become the newest Princess - the F45. While the official photography of the new F45 has yet to be released by the factory, the renderings have us excited already. For the owner looking for an under-50 foot sport yacht, but doesn't want the feeling of being cramped on a smaller boat, the Princess F45 is a perfect option. We can see from the main and lower deck layouts below that the living spaces on board the F45 are very well proportioned. Powered by Volvo IPS 600's that reach a top speed of 31 knots, the Princess F45 combines the performance you expect from a Princess as well as the finer details that make owning the F45 an experience. The Princess F45 is truly innovative as well as it features an electrically extending aft cockpit. With a touch of a button, the aft deck extends out from the boat increasing your overall available square footage. Remarkable! For more information on the new Princess F45, contact your SI Yachts sales professional today. A secret has been brewing for some time at the factory in Plymouth, England. Under shrouds of secrecy, a new boat disguised in a unique camouflauge began to appear during sea trials. At the recent Cannes Yachting Festival, the new Princess R-35 Day Cruiser was finally unveiled. Unique to the Princess R-35 is a Active Foil System (AFS) that was created with BAR Technologies and aims to stabilize the boat while also improving maneuverability in any conditions on the water. "We'd been working in the America's Cup on hydrofoils," said Martin Whitmarch, former CEO of the Land Rover BAR America's Cup team, who was head of Formula One team at Maclaren for 20 years. "Flying on hydrofoils is an uncomfortable business when you land, so we didn't quite go that far but we realized that by using some very clever foils that are actively controlled, not only could we make efficiency improvements in the order of 30 per cent, but we could affect the ride handling and sea keeping of that boat in a unique way," he said. "It really is an usual feeling boat. When you're up on hydrofoil its incredibly smooth, incredibly comfortable. And the performance we're going to get from this boat is going to be something quite unique." The new Princess R-35 will make its American debut at the Fort Lauderdale Boat Show that starts at the end of October. With speeds of over 50 knots, the R-35 is an adventure in itself for day cruising or even short overnight trips. It even comes in multiple color options to fit the owner's style or match as a tender to a larger yacht. If you want to receive more information on the new R-35 contact your SI Yachts Sales Professional today.